I have to set up my Unistream to works at same time as Slave by Modbus RTU TCP and Masert by Modbus RTU RS485. I must use/set the same PLC communications->Protocols->MODBUS->Master->RS485 or I can mix/use the first with the PLC communications->Physical->Serial COM ? I hope that my qestion is clear enough. - using "advanced modbus" if a data exchange don't works I use an instruction to empty the buffer to try again...using "periodic/aperiodic" this works automatically or I have to do something? - when I compile the project I have a warning like: Do NOT place "COM: MODBUS" Ladder elements on the bus bar, or anywhere it will be continuously activated. Use a delay of 10-50 msec between requests. Click on "Find All Elements" to locate all of the instances where it is used in the program ...I placed a "P" contact and a "modbus aperiodic trigger" to do some test...this warning is for safety or I am missing something? 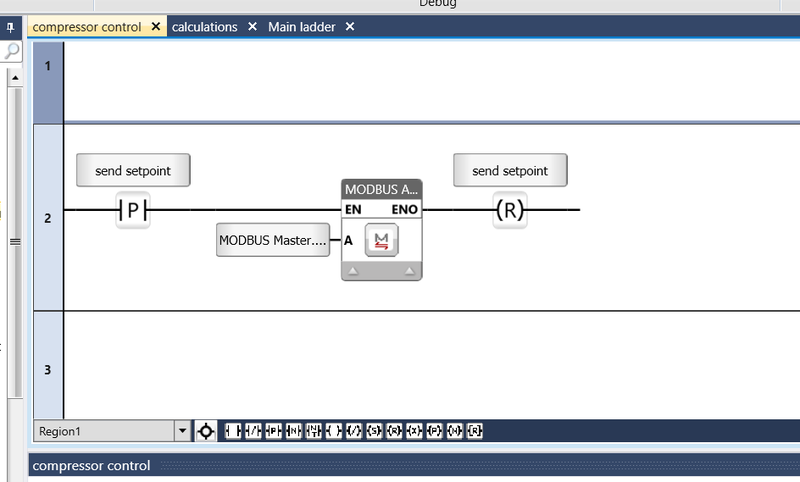 I also have that error- Do NOT place "COM: MODBUS" Ladder elements on the bus bar, or anywhere it will be continuously activated. Also the command is not being called continuously (with a positive transition contact). The program appears to work OK,but I still get this error at each download. It is just a warning, ignore it. We cannot detect (unless the element is directory on bus bar) that it will be called continuously or not), since it might be on a bus bar of another function that is called through a timer, or the other way around: not on bus bar, but after a Contact that is always open dues to the state of the connected bit.